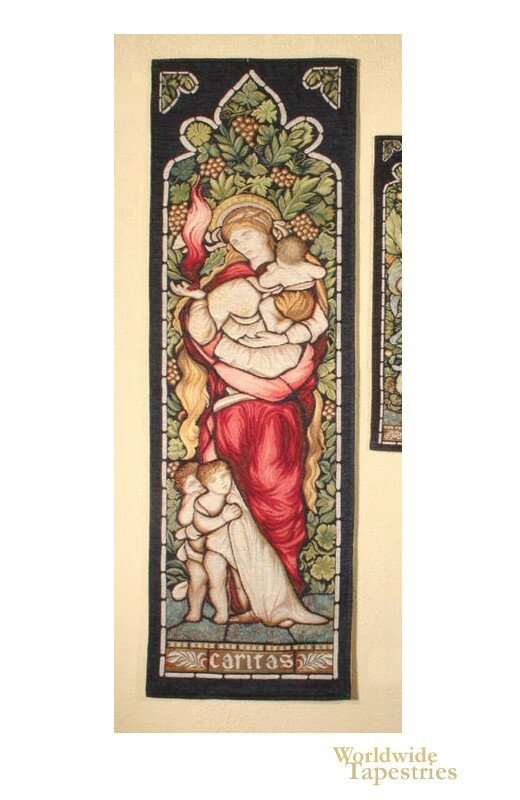 In Charity tapestry we see a wall hanging which resembles a glass stained window of the saint of Charity and children. Here we see a lovely celebration of stained glass window art and tapestry art with a tapestry which gives the illusion of a stained glass work. The robes in red, and the foliage in green provide a striking contrast and is balanced with golds, browns and yellows. This church themed tapestry is elegant and beautiful. This religious tapestry is backed with a lining and has a tunnel for easy hanging. Dimensions: W 18" x H 57"